We’ll start off creating a new StatusBarBehavior class and inherits from DependencyObject and implements the IBehavior interface. For this behavior, we will not need to hook into the associated dependency object. However, it’s important to note that we could get and store the StatusBar object within the Attach method. We’ll want to add dependency properties to the behavior that will control the visibility, foreground and background colors and the opacity of the status bar. When creating a behavior to wrap existing functionality it is important that the default values of your properties match the default values of the functionality you are wrapping. This is because we want our PropertyChangedCallback methods to be called when the value is changed and function accordingly. Each of the properties we implement will need to account for these default values. This should look very similar from the behavior to control the progress indicator. Next we’ll create a property for the opacity of the background. Unlike in Windows Phone Silverlight Apps, the opacity defaults to 0. Our property should also default to 0. Nullable<Color>. When we created the ProgressBehavior, we found that when we tried to create a dependency property in our behavior that it had some issues. We have issues again, but now they are different. Based on the last post, create the ForegroundColor property as you think you would with a nullable Color property. Notice that we can set the default value to null (weird). The BackgroundColor will require a little extra work. Because the BackgroundOpacity defaults to 0, setting the BackgroundColor will do nothing unless the opacity is changed as well. We could take two approaches with the behavior, either force the use of the opacity property, or set the opacity if the background is set. I like the latter option. If the background is set, then obviously they want to see it! 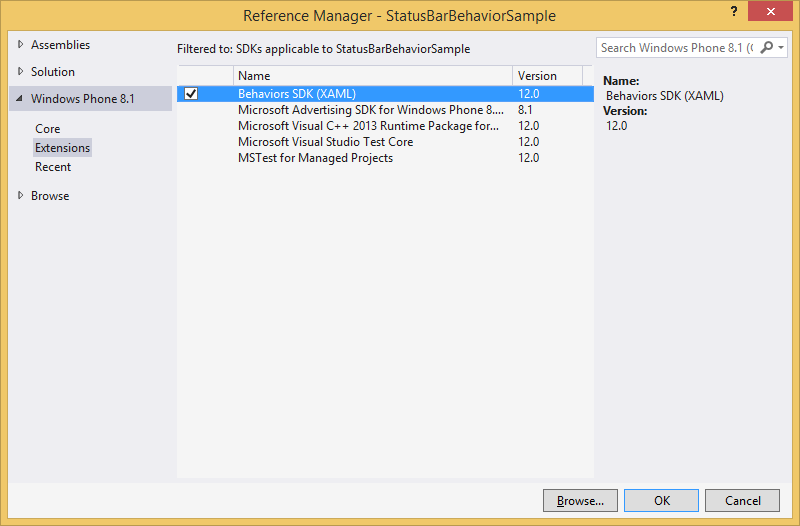 Now we have a complete behavior that is very similar to the Windows Phone Silverlight SystemTray. 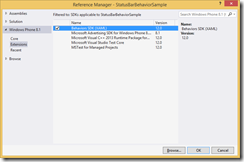 Download a sample to play with the behavior, or just download the behavior.